Exactly as pictured and looks great. 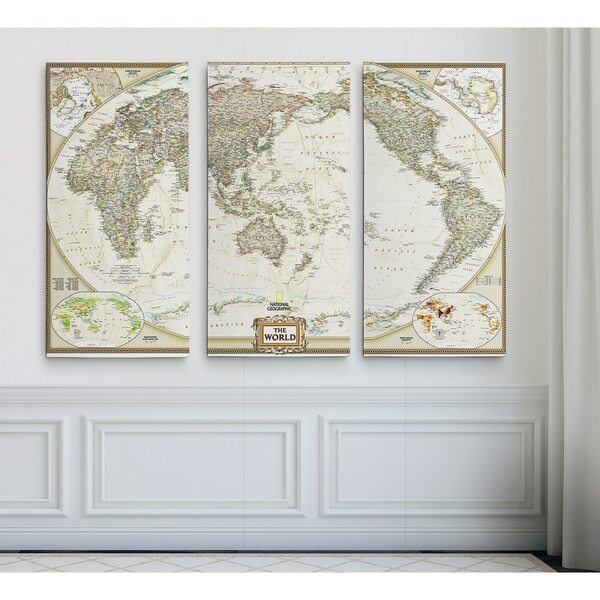 National Geographic World Map -Gallery Wrapped Multi Piece Canvas A premium hand wrapped Giclee canvas. 100-percent Created to last. Individually hand wrapped to very high standards. Printed and inspected one at a time utilizing the latest archival UltraChrome Giclee inks Available in 3 sizes for you to choose from 24"X36" TOTAL SIZE - Consisting of 3 Total Panels Each measuring 12"x24" x1.5" deep 32"X48" TOTAL SIZE - Consisting of 3 Total Panels Each measuring 16"x32" x1.5" deep 40"X60" TOTAL SIZE - Consisting of 3 Total Panels Each measuring 20"x40" x1.5" deep Each piece includes hanging accessories and is ready to hang. You need only to apply an anchor to the wall of your choice. If youre looking for a technically visually correct map, this one is not for you. I hadnt noticed the hemispheres were backward until i received the map as i was browsing through a ton of them looking for the right colors and sizes for so long. As far as quality, they were great and i got the midsize which was perfect above my couch, but i wish i had noticed it was backward before purchase. Other than my own mistake, i do love it and it doesnt really seem to bother me or my husband and we love it! I like this map set a lot. This is one of the few that is actually large enough to anchor a living room sofa. The print quality is good and the off white background goes with any decor. Purchased the largest size and it looks beautiful in my office! I think the quality is not good, and the map details are very hard to see. Disappointed, but will still put it a wall somewhere in the house. This is an amazing canvas that fits well in our den where we have high ceilings and furniture with the same colors! Love it!!!! Purchased this for my classroom and it looks amazing. It wasn't too hard to hang, just needed a little patience. Would definitely recommend for home, office, or classroom. This artwork looks wonderful in my office. It is very nice looking and professional. It was very easy to hang as long as you have someone to help and a level is required. It looks authentic. A great conversation piece. The colors in this art piece are even richer and more beautiful in person. I was pleasantly surprised when it arrived and it looked even better than it did on the website! This just might be too nice for our office. Amazing quality.